Volcanoes are pretty cool. I don’t really want to come across on that is angry because I hear that can be bad for your health, but I do like to find out about how quickly the geology of a landscape can change. 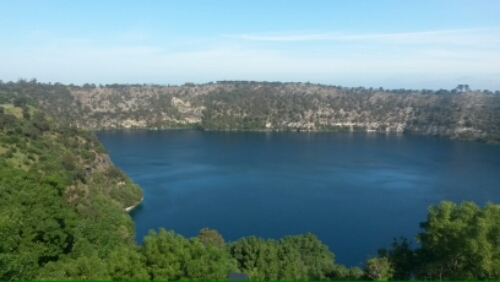 I am currently in Mt Gambier for work and after several trips to the town I have made it to the lakes on the edge of town. In general the local terrain is flat with lots of limestone (caving anyone?) but just on the edge of town there is a rather large hill with three rather large holes in it. The hill is a dormant volcano, and the rather large holes are three craters are the remains of where the volcano has decided to be less dormant at various points in time, most recently 4200 years ago which is pretty recent really. Almost more interesting than the big holes is the water which fills one of the lakes. It is bright blue in summer, decidedly grey in winter and spectacular all the time. So, with my little geek out done – here are the photos. 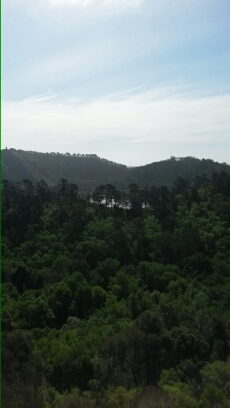 I’ve always been fascinated with Mt Gambier’s blue lake… pretty speccie, eh? Thanks for reminding me about it! They are pretty amazing. I am going to have to time a trip to see the colour change, and maybe take a better camera next trip!